Electricity, gas and propane are expected to be higher than last year which means just about everyone can expect higher bills as the temperatures cool down. A recent report from the government forecast that natural gas users can expect to see a 13% increase while electricity users will go up about 2%. Aside from not using heat at all, local HVAC and plumbing company R.T. Moore says there are many ways home owners can cut costs and help reduce their bills. Be sure that heating systems are in working order. Older systems are much less efficient than newer models and they will be even less efficient if they aren’t maintained regularly. Contact a company that specializes in routine maintenance and heating repair in Indianapolis. Improve insulation, seal cracks, and consider adding energy-efficient window coverings. Keeping hot air in and cold air out is one of the best ways to reduce heating costs and use less energy overall. It could be a small investment upfront, but the improvements can pay for themselves over the years. Be sure to check ducts for leaks as well. Reduce energy use in other areas. Turn off TVs, computers, lights and various other electronics when they aren’t in use. Invest in heated blankets or heated mattress pads for bedrooms. Heating the whole house at night can be a waste if there are only a few people inside. Simply warm up the beds and turn down the heat. Turn down the thermostat especially when no one is home. Even a few degrees can make a huge impact on utility costs. Each degree can cost about 3% more so turning it down when no one is home or at night can make a big impact. Keep vents and filters clean. A heating system has to work harder to push air through clogged vents which is less efficient and more costly. 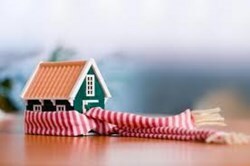 For more helpful tips to heat your home this winter, contact R.T. Moore at 855-786-1955 or visit http://rtmooreservice.com/. R.T. Moore has established itself as one of the country’s premier mechanical contractors providing residential plumbing and sewer/water installations in Indiana and Florida as well as plumbing and HVAC services for the multi-family industry across 16 states.